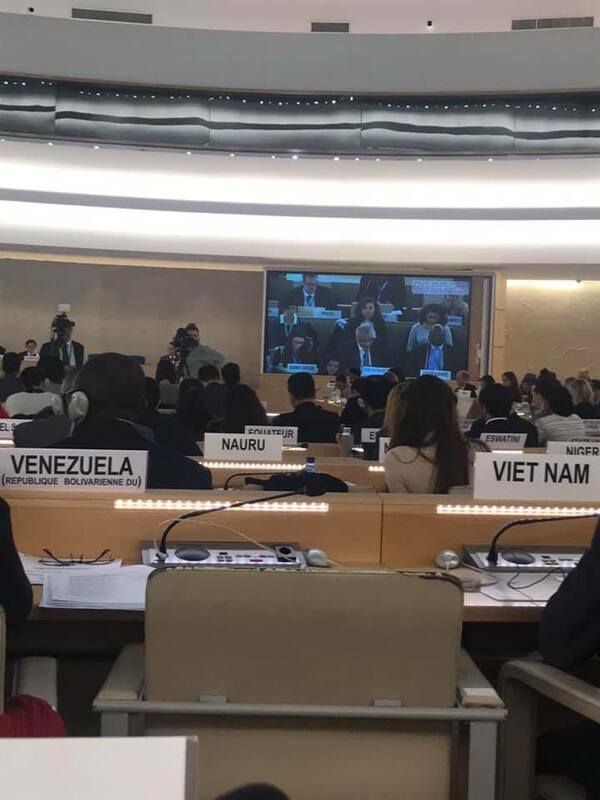 BADIL BADIL participated in the 40th session of the United Nations Human Rights Council (UNHRC) which took place in Geneva between 25 February and 22 March 2019. BADIL’s interventions included: 1 written statement, 3 Oral Statements, and series of meetings with States representatives and UN officials. BADIL submitted a written statement that highlighted the reality of Israeli de-facto annexation of the “Gush Etzion” colonial bloc that contains 38 colonies and 87,000 Jewish-Israeli colonizers. It drew particular attention to the recent advancement of plans for a large colony called “Givat Eitam” on Bethlehem’s southern urban boundary, which will further the suffocation and isolation of this major Palestinian city. 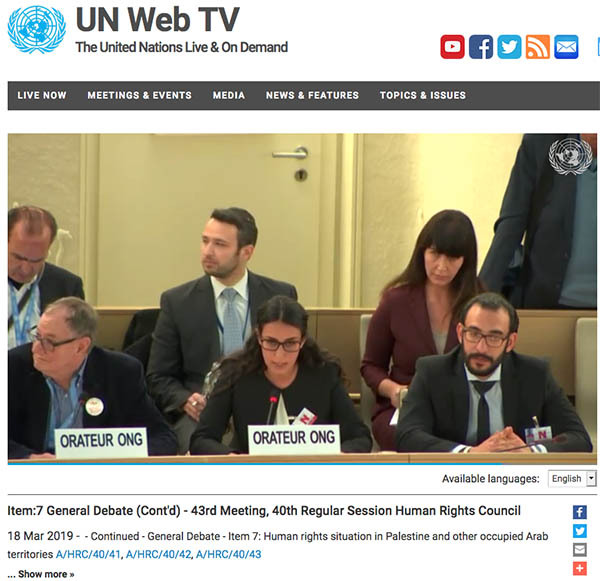 In the meantime, under item 3, which is dedicated to the promotion and protection of all human rights, BADIL delivered an oral statement that highlighted the issue of home demolitions of Palestinians as a collective punishment policy. BADIL called upon the international community to take immediate action to put an end to Israeli crimes. Under item 7, which is dedicated to the issue of Palestine specifically, BADIL delivered an oral statement highlighting the importance of the UN database on business in colonies, to insure transparency and the compliance of companies to principles of international law in the occupied Palestinian territory (oPt). To that end, BADIL called for the immediate publication of the database of businesses active in Israeli settlements. Commenting on the Report of Commission of Inquiry into the 2018 protests in the oPt, BADIL delivered an oral statement that highlighted the ongoing mass civilian casualties in the Gaza Strip, and the ongoing impunity of Israel. BADIL called for the blockade of Gaza to be lifted and for an expansion of the mandate of the Commission of Inquiry to insure accountability of perpetrators of human rights violations. Furthermore, BADIL held several meetings with UN Officials and representatives of 13 European states to brief them about the situation of human rights in the oPt, the ongoing Israeli violations, and to encourage them to meet their obligation towards protecting Palestinian civilians. 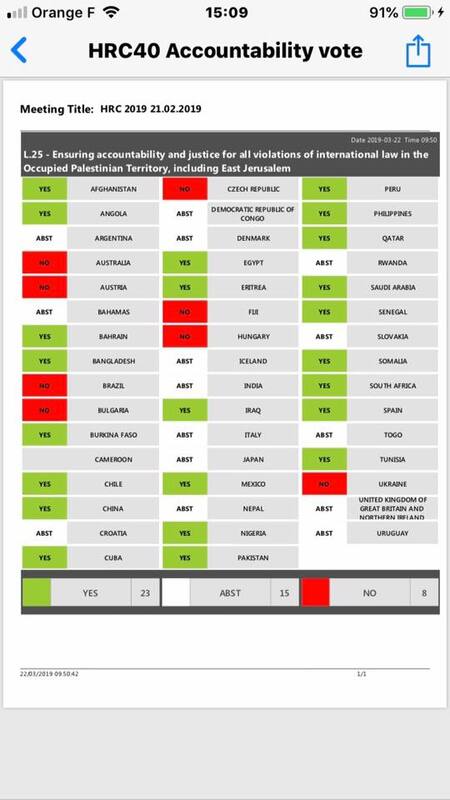 In the course of the 40th Session, the UNHRC adopted several resolutions regarding Palestine: resolution A/HRC/40/L.26 on the “Right of the Palestinian people to self-determination”; resolution A/HRC/40/L.28 on the “Israeli settlements in the Occupied Palestinian Territory, including East Jerusalem, and in the occupied Syrian Golan”; resolution A/HRC/40/L.25 on “Ensuring accountability and justice for all violations of international law in the Occupied Palestinian Territory, including East Jerusalem”; and resolution A/HRC/40/L.27 on the “Human rights situation in the Occupied Palestinian Territory, including East Jerusalem.” Dignity, and a number of Palestinian Community-based organizations on both sides of the Green Line, in order to provide space for rights holders, especially refugees and displaced persons, to express their rights and defend them.